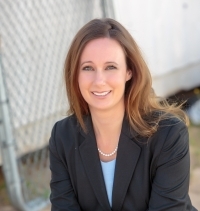 Jana Forsythe, an alumna of the UNLV Executive MBA Program (Cohort 3) and President/CEO of F.E.I. Construction in Las Vegas, is newly named president of the UNLV EMBA Alumni Association for a one-year term that commenced on January 1, 2016. Forsythe’s background as a construction estimator, project manager and team manager for $300+ million annual revenue companies, led to the founding of her own company F.E.I. Construction. This Las Vegas-based general engineering and general building contractor firm specializes in commercial tenant improvements. Among her many professional accomplishments, Forsythe was 2014 Women of Distinction Award recipient for Real Estate/Construction, 2015 NAWBO Corporate Partner Chair and on the UNLV Alumni Board from 2014-2015. Jana is slated to serve as 2017 NAWBO President. Also, Forsythe is an active alum of Embry-Riddle Aeronautical University from which she received her bachelor’s degree in Management of Technical Operations. Forsythe is happily married and shares four children, three dogs, several chickens and one cat with her spouse. Her passions include chocolate, wine, hiking, tennis, collecting farm fresh eggs daily, visits to animal shelters, soaks in hot springs, road trips of the contiguous United States, and pistol shoots with Women of High Caliber. Shortly after taking office, Forsythe was asked about the 2016 outlook for the UNLV EMBA Alumni Association. What are your thoughts on assuming the EMBA Alumni Association presidency? Darwin Hopwood (Cohort 8) did a phenomenal job launching and leading the association during its first years. We cannot thank him enough for his efforts and accomplishments. His enthusiasm and hard work have engaged the support of the alumni and provided a strong foundation for the association’s structure. He has left big shoes to fill. I feel fortunate for the opportunity to lead the association at this pivotal time as we build on the accomplishments of the past. With the tremendous staff support we receive from Nikkole McCartin (Cohort 7 and current director, Executive MBA) and Carissa Marquez (program coordinator), this board will help the alumni association realize extraordinary success for our organization, our university and our community. What’s on the UNLV EMBA Alumni Association drawing board for 2016? The association is still in its infancy, so we have kept this year’s goals straightforward. The EMBA alumni board has identified five areas for concentration. For the past two years, EMBA alumni have gathered for reconnecting, fun and relaxation in Del Mar, California. We are going to do a third year. Watch for more information regarding the July 22, 2016 Del Mar trip! Participation is one of our top priorities. To that end, we have identified a few opportunities where alumni can connect with each other, as well as current and future students. The program’s events provide opportunities to learn, network and connect. Plan to participate in such events as the Spring EMBA Connect Event; a welcome for Cohort 15 in May; a fun-filled evening with Super Summer Theatre at Spring Mountain Ranch in August; or Cohorts & Cocktails, a student recruitment event this fall. Join your fellow cohort members at the annual UNLV Lee Business School Takin’ Care of Business golf tournament. Watch for more information on tournament registration, fund raising efforts, and how EMBA alumni can further support and participate. The UNLV EMBA Alumni Association will continue to encourage all EMBA alumni to consider Corporate Membership and Lifetime UNLVIP Memberships. Finally, the board will continue efforts to establish a structure that enables us to leverage the resources necessary to better support the alumni. What do you want to say to your fellow alumni? As proud graduates of the UNLV’s Executive MBA program, we are the Who’s Who of the Las Vegas business community. We have the challenge and obligation to pay it forward to help shape future leaders. Those who came before us have paved the way, and our responsibility is to continue their efforts. As alumni, we represent the essence of the Lee Business School’s mission: Cultivating Leaders Who Transform Business. I urge all alumni to become involved and engage with the association. An alumni network is only as strong as its membership.